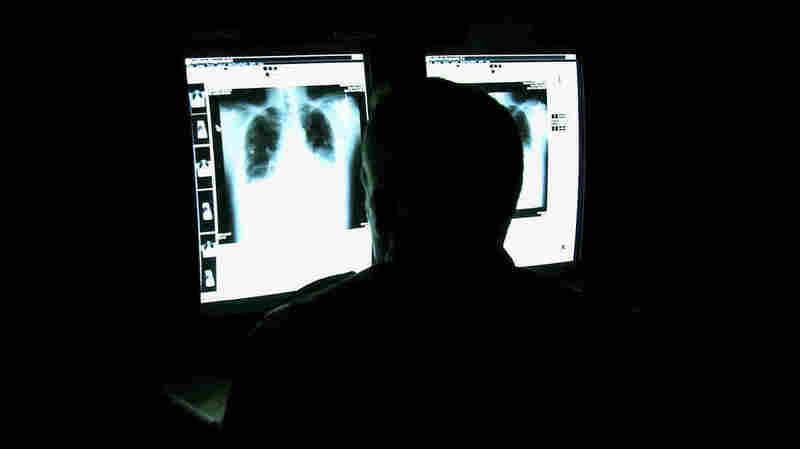 Radiologists Say It's Time To Come Out Of The Dark : Shots - Health News Radiologists have an image problem with patients. Many of them don't know who the doctors are or what they do. A survey finds that only about half of patients receiving CT scans even knew radiologists are doctors. Never mind that man or woman sitting in the dark deciphering the pictures that reveal the inner workings of your body. It's common knowledge in medicine that many radiologists pick the lucrative specialty (averaging about $315,000 in pay a year) because the hours are fairly predictable and the typical work doesn't require dealing with patients. But radiology has an image problem with patients, it seems. Many of them don't know who the doctors are or what they do. Only about half of patients surveyed when receiving a CT scan thought radiologists were physicians, according to results presented this week at the Radiological Society of North America's annual meeting in Chicago. Why would it be any different? Radiologists, like pathologists, work in the background giving information to other doctors who diagnose and treat patients. Patients meet the techs who put them in MRI and CT scanners or lay them down on an X-ray table. And maybe at the end of it all, patients get a disk with the pictures and a jargon-filled report of what the radiologists found. There are exceptions, of course. Take interventional radiologists, who very definitely get to know you as they snake catheters throughout your body. And radiologists who specialize in breast imaging often work directly with patients. Still, the radiologists from Indiana University who conducted the survey of more than 300 patients scanned at an affiliated hospital say their findings suggest patients would like to know more. The vast majority — about 83 percent — were interested or very interested in getting a copy of their radiology reports. Nearly two-thirds would like to be able to find out more about the radiologists from website bios. What about laying eyes on them? "We didn't answer the question, 'Do they want to meet us face to face,' " Dr. Peter Miller, a radiology resident who worked on the study, tells Shots. "But they do want to know more about us." Miller says he and his colleagues "think ideally that radiologists do need to step out of the reading room...." It may be "economically impractical" for radiologists racing to interpret lots of images in a hurry to do much of that, he concedes. But, Miller says, "we need to find practical solutions to address the desires of patients."